Find answers and general information quickly about the forms tool in HubSpot. Does HubSpot track activity before a contact converts on a form? Why does my contact not have any page views even though they've submitted a form? Why are some of my contacts missing a value for IP Country, IP State or IP City? Why is a property not available as a field in the form editor? Can I use a company/deal/ticket property as a field on my HubSpot form? Can I use progressive profiling in a form with cookie tracking disabled? Can I change the field validation text on my form? How do I integrate my custom-built form with HubSpot? Can I customize form submission notification emails? How do I set a contact's lifecycle stage with a form? Can I redirect visitors to different thank you pages based on their form responses? Can I embed a HubSpot form in an email? What field validation is on HubSpot forms? Why is a field not appearing on my live form? Why do I have more form submissions than contacts? Why aren't form submissions creating new contacts? Why was my contact's file removed from their form submission? Why do I see 'No contact record' in my form submission? 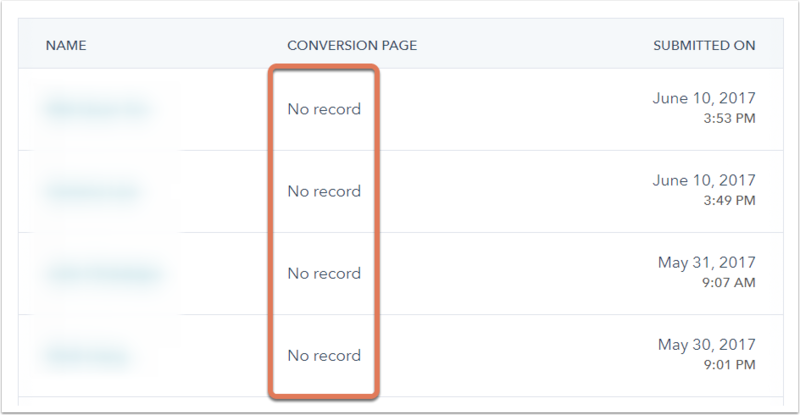 Why do I see 'No record' for the conversion page in my form submission? Yes. When a visitor lands on your site, HubSpot tracks their activity and identifies them as a unique visitor by setting tracking cookies in their browser. Once the visitor submits a form, HubSpot will try to associate the new contact record with any previously tracked activity. If a visitor clears their cookies before submitting a form on your site, HubSpot will not be able to associate previously tracked activity with the new contact. The contact has chosen to block cookies. Cookie tracking is disabled in the form options. If you're using the HubSpot Forms API, the form is not set to pass a cookie. The HubSpot tracking code must also be installed on your site and firing correctly in order to track page views. Contacts must submit a form with cookie tracking enabled or interact with (open or click) a tracked HubSpot email to have an IP address associated with them. In some instances, HubSpot may not find a match for the geolocation properties against its databases. IP address location data can be inaccurate or spotty in certain geographical locations, so there may be instances where HubSpot cannot find data for all three IP properties. If a property is not available as a form field, it may be because it is not set up to be shown in forms. Select the Show in forms checkbox. If your property has multiple options, ensure that the Show in forms switch is toggled on for each option you want to be able to use in your forms. No. Only contact properties can be added as a field on a HubSpot form. If you have a Professional or Enterprise account, you can use a workflow to copy contact to company properties. No. When cookie tracking is disabled on a form, there's no tracking cookie for the form fields to reference to identify a contact and progressive profiling will not work. If you need additional functionality that is not available with standard HubSpot forms, you can work with your developer to integrate your external forms with HubSpot using the HubSpot Forms API. If you have a Professional or Enterprise account, you can use workflows to create and send custom internal notification emails in addition to the default form submission notification emails. Add the Lifecycle stage property to your form as a hidden field and set a default value. Set the Lifecycle stage property with a workflow (Professional and Enterprise accounts only). No, it is not possible to send visitors to different thank you pages based on how they respond to questions on your form, unless you build a custom form and integrate it with HubSpot using the HubSpot Forms API. If you have a Professional or Enterprise account, you can use workflows to send different follow-up emails based on how contacts filled out a form. No, it is not possible to embed HubSpot forms in your emails. Forms are not supported in emails across common email clients due to security risks. Instead, it is best practice to place a call-to-action or a link to landing page with a form in the body of your email. Email addresses entered into the Email field on a HubSpot form are immediately validated by HubSpot. If the email address is not valid (does not exist, is misspelled, etc. ), the form cannot be submitted. You can also block specific email domains or validate phone numbers in form submissions. If you want to build a form with custom validation rules, you can work with your developer to integrate your custom form with HubSpot using the HubSpot Forms API. If some fields are not being displayed on your form when you add it to a page, it is likely that the form has progressive profiling and HubSpot remembers you from previous interactions or testing. Progressive fields are hidden if the visitor has previously filled in the field or if the contact already has a value for the property. Form submissions are recorded any time the Submit button on a form is clicked. If a form is submitted multiple times with the same email address, only one contact will be created, but each form submission will still be recorded. If a contact is deleted from HubSpot, their form submission will still appear, but they will no longer show up in a list filtered by the form's submissions. For a form submission to create a contact record in HubSpot, the default Email field must be used on your form. If not, you must allow form submissions without email addresses to create contacts. If the form submission uses an email address already associated with a contact record, or if the submission is done in a browser with tracking cookies tied to an existing contact record, it will update the existing contact record and not create a new one. Learn more about how HubSpot deduplicates contacts and how to recreate contacts overwritten by form submissions. The Email field is not included and/or required on your form. The contact associated with the submission has been deleted from HubSpot. If your form is embedded on an external page, the tracking code may not be installed or is not firing correctly. If you're using the HubSpot Forms API, the pageName and pageUrl parameters may not be passed in the form submission. 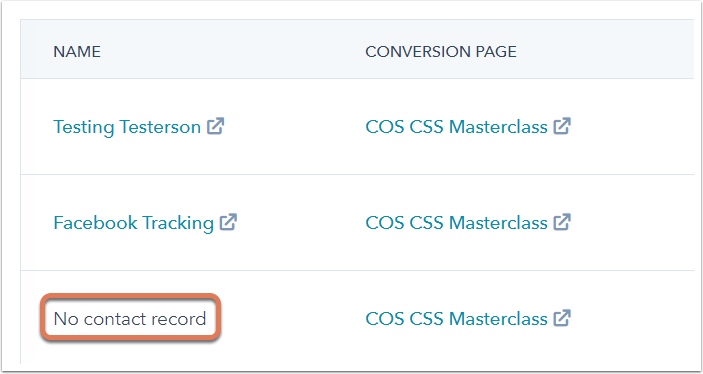 These parameters are required for HubSpot to record the submission page. Learn more about the required parameters for form submissions via the API.